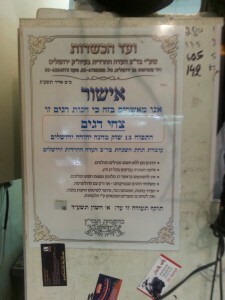 For those seeking such an option, there is finally an Eida Chareidit certified fish store in Machane Yehuda, located on a side street between Eitz Chaim Street (the close street) and Machane Yehuda Street (the open street) referring to the streets between Aggripas and Yaffa Streets. Posted on July 1, 2013 by JKN Israel. This entry was posted in JKN Alerts, Machane Yehuda - The Shuk. Bookmark the permalink. 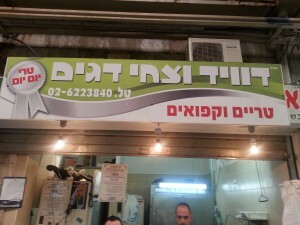 There is an Eida HaCharedit fish store in HarNof (Jerusalem) on Rechov Agassi 29 that has excellent fresh fish. To the best of my knowledge, NO. The manager of the fish store on Agasi is an American and very accommodating. All fish are cleaned and individually packaged nicely for immediate use or for freezing for later use. Asked the fellow in the shuk and he told me same owner for both. I cannot confirm, simply passing along the information I receive.